I'm now live blogging the Maryland, Alaska, Minnesota, Arizona meet. You know the drill, refresh, refresh, refresh! I'm obviously getting on this meet late, so forgive me. Alicia Moreno UB MD - jump to HB, giant 1/2 + jaeger, bail, DLO, stuck. very nice. Deanna Magro Maryland Beam - BHS + LOSO, HS + loso, falls, sw + straddle cross, beat jump + straddle 3/4, round off + 2/1 dismount, step back. 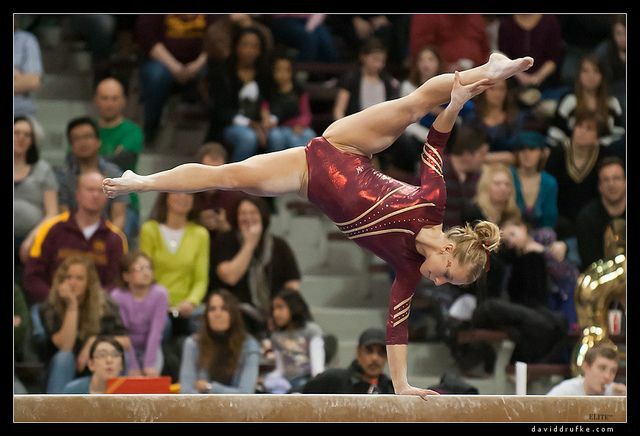 Minnesota FX Bailie Holst, double back to finish her routine. Madison Cindric -Arizona VT FTY - hop on landing. Sarah Faller BB MD - 1/1 turn, BHS + LOSO, slides right off the beam LOSO, sw + tuck 1/1 jump, round off + 2/1 dismount. Caitlin Rahon FX Minnesota - double back, and that's the end of the routine. Bailey Abernathy VT MD - hs front pike 1/2, step back. Arizona's Madison Cindric fell on her double front dismount on bars. Amanda Bertorello FX, double pike, 1 1/2 + front tuck, sw ring + tour jete, double back, solid. Alaska has the brightest leos I have ever seen in my life.